Photo and Story by Julie Strand Cyrille Davidson is a fourth grade student at Pierce Elementary School in Riverwest. She is also part of the Community Learning Center that takes place at Pierce until 5pm. After the regular school day commences, the school becomes a Community Learning Center of (CLC) and students are offered the option to participate in different activities such as African Dance, Chess Club, and Woodland Pattern’s Urban Youth Literary Arts after-school classes. C Cyrille started taking Woodland Pattern’s after-school classes during the summer of 2009. During that class Cyrille decorated a flower pot with her own drawings and words inspired by different nature poems read in class. “I planted a flower in my flower pot. I tried to make the flower grow by putting a worm in it. Worms fertilize flowers, their poop makes it grow just like cows.” Since the summer, Cyrille has been a constant participant in WP classes contributing to a Poetry Movie, creating an art project for Dia De Los Muertos containing a calavera poem, and most recently writing and performing songs for a Woodland Pattern after-school CD. 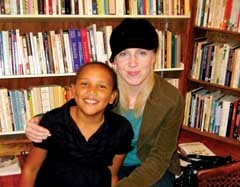 Cyrille brought her mother to Woodland Pattern at the beginning of the school year and showed her around the bookstore and art gallery where the after-school classes take place. “One day I was like, lets go I want to show you woodland pattern! Mom likes to read books all the time and she liked all the books, ” said Cyrille. Cyrille enjoys coming home after a project is finished at Woodland Pattern and showing her mom what was made. Sveta also came to the screening of the Poetry Movie when it was finished. “All of the projects are great. The Dia De Los Muertos project was a little different, but it was interesting idea instead of making a Halloween project,” said Sveta. Cyrille and Sveta have only lived in Riverwest for two years. When asked why they choose to move to Riverwest, Sveta said that she lived in many different neighborhoods in Milwaukee and then she moved to California. “Mom is allergic to the cold,” added Cyrille, “really she is.” Sveta added, “And I’m originally from Russia, Siberia to be exact!” After a few years in California, Sveta and Cyrille’s family moved back to Milwaukee and Sveta knew that she wanted to live in this area.